Like many Kuiper belt objects of its type, it is likely to be composed of dust and ices that came together at the dawn of the Solar System more than 4.5 billion years ago. 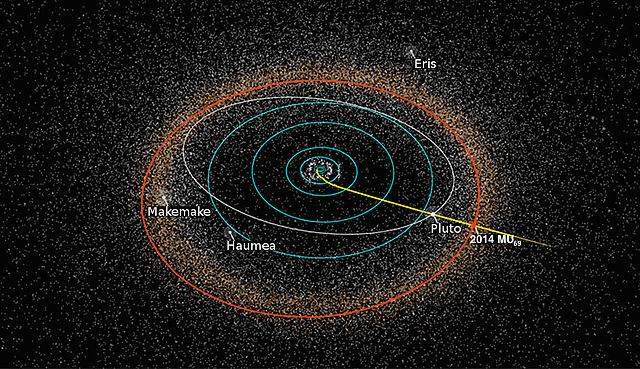 New Horizons will study Ultima’s shape, composition and environment. Scientists hope Ultima can provide insights on how these distant objects formed. One idea is that they grew from the mass accretion of a great many pebble-sized grains. New Horizons successfully “phoned home” at 10:28 a.m. EST, letting NASA scientists know all of its systems survived the flyby of Ultima Thule. The first real images will now slowly trickle in over the coming hours and days. “We have a healthy spacecraft,” Mission Operations Manager, “MOM,” Alice Bowman announced to a crowd of cheering scientists Tuesday morning.